Two straight days of public hearings heaped criticism on the proposed Clear River Energy Center. Much of the hostility came from a lack of information about water agreements and the promised benefits of what stands to be Rhode Island's largest fossil-fuel power plant. The state Energy Facility Siting Board will address these and other issues at upcoming meetings, as well as map out a decision process that is expected to take nine months or longer. Charlestown, Dec. 5: All of the speakers at the hearing expressed disappointment that the Chicago-based energy developer gave few details — much less answered questions — about its plan to draw water from the local watershed. “It’s not helpful when we don’t get information," Planning Commission member Francis Topping said. “It does make everything look a little shady. We need accurate and truthful information." Further complicating the matter is the location of the local water source. During a 15-minute slide presentation, John Niland, Invenergy’s director of business development, showed the location of the well as an indeterminate dot on a large map of southern Rhode Island. Town officials assume the water will be taken from land owned by the Narragansett Indian Tribe in or near Charlestown. But a recent letter from retired Chief Sachem Matthew Thomas suggested that the water may be drawn from tribe-owned Crandall Farm in Westerly. Topping and others who filled the cafeteria at the regional elementary school called for a cost-benefit analysis and information about water-truck traffic, road wear, tourism and safety. Topping raised the point, echoed by many residents, that all properties rely on water from wells while discharging into septic systems, thus the aquifer relies on a stable supply. “Taking water out is like taking money from your savings account and not putting it back in,” Topping said. Town administrator Mark Stankiewicz said he learned about the water agreement through the newspaper and was embarrassed that he didn't have information to share with the public and other town officials. Stankiewicz explained that the town hastily sought legal advice and hired environmental engineers and hydrologists to analyze the limited information. The process, he said, needs transparency and public confidence. “Right now, I don’t believe that standard has been met," Stankiewicz said. Randy Noka, a member of the Narragansett Indian Tribe tribal council, said the water agreement approved by Thomas and medicine man John Brown isn't valid because it wasn't approved, or even voted on, by the council. “They can’t obligate tribal resources like those two gentlemen tried to do," Noka said. “It’s a tribal vote and our rights will be held up by tribal members." Noka also urged Charlestown to be considerate of the environment as the town grows. “As things go forward in the town — development, houses, businesses, whatever — appreciate the fact that what those businesses and houses will do towards the aquifer also and the recharge area and the pollutants that may go back into it from the septic (systems)." Joseph Larisa, town solicitor for Indian affairs, said the land in Indian Cedar Swamp may belong to the Narragansett Indian Tribe but falls under state and local planning and zoning regulations. “It is part of conservation lands," he said. "Both town and state laws apply to the where the well is located and we look further to briefing the issue to the town on what that means." Larissa explained after the meeting that he expected to present the information to the Energy Facilities Siting Board (EFSB) in the coming weeks. Several attendees simply wanted to know why, with all of the opposition and unanswered questions, the application is still under consideration. “I just have one question: Why are we here? This thing was dead on arrival. Our time was being wasted," Richmond resident Susan Fuller said. “And our communities are being held at risk by a company that just wants to continue to make money. Why are we here and why hasn’t this been put to rest long before now? It’s ridiculous." Edward Fox of Charlestown referred to the giant poster and map showing the 32 Rhode Island municipalities that oppose the natural-gas/diesel power plant. “It’s unconscionable that we are actually still talking about this,” he said. The proposal, he said, contradicts Rhode Island's long-term water plan. “Let’s move on and set this thing out to pasture," Fox said. Others criticized Niland in song and verse for promoting an unhealthy and unsafe project. Burrillville native Squeaky Patterson, for one, delivered a limerick directed at the Invenergy official. Burrillville, Dec. 6: This public meeting was the fifth hearing hosted by the EFSB and the seventh for community input. The 125 or so attendees at Burrillville Middle School was one of the smallest and least contentious. Like the Charlestown hearing the night before, no one spoke in favor of the power plant and there was no visible presence from unions and trade groups. Niland began the meeting with an overview of the Clear River Energy Center (CREC), calling the proposed natural-gas/diesel facility the most efficient power plant in New England and maybe even the nation. He tempered concerns about diesel fuel saying CREC would only burn the highly polluting and water intensive fuel during rare cold spells, perhaps for three to four days, like the polar vortex in 2014. If approved, the nearly 1,000-megawatt fossil-fuel facility would operate the first of two turbines in June 2021 and the second by June 2022. Niland reiterated that the cooling water would be trucked in from Johnston. Water use, however, will be reduced from 100,000 gallons per day to 15,000 gallon, because of a change in the design of a cooling system that captures and reuses steam, he said. “It is the most efficient way to produce power using a fossil fuel,” Niland said. Although the proposed power plant would be the largest emitter of carbon dioxide in Rhode Island, Niland noted that it would reduce emissions in New England by replacing electricity from retired, more polluting power plants. He also claimed a third of the region’s power plants are at risk of retirement and that renewable energy can't replace that electricity because of intermittent power output. Many opponents criticized Invenergy for failing to deliver facts and figures about the project. Burrillville resident Julie O’Rourke expected more details about the water plan. She asked for an emergency evacuation plan. “If this proposed power plant is so efficient, so state of the art, so wonderful, then why has Invenergy been so secretive and so deceitful?” O’Rourke asked. The EFSB will address the Narragansett Indian Tribe water plan and other contingent water deals at one of two upcoming public meetings scheduled for Dec. 12 at its Warwick office at 10:30 a.m. 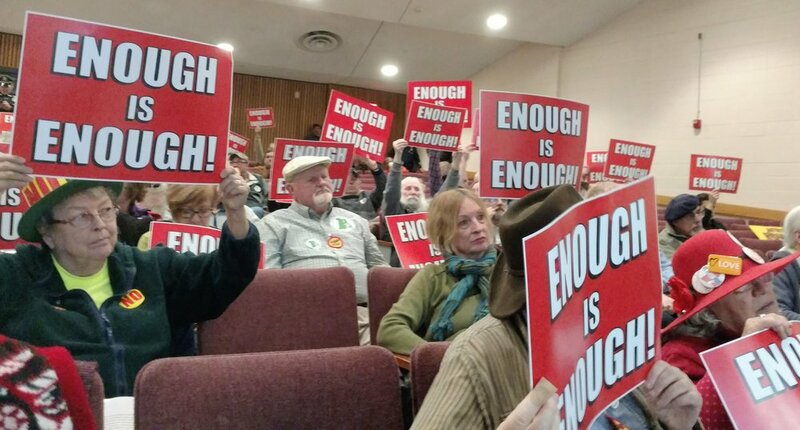 Since the three-member board can only discuss the power plant at public meetings, the committee will review the water plans and address a letter from Niland refuting the controversy about the power plant’s interconnection agreement with National Grid. A 9:30 a.m. hearing will address four motions: a request by the town of Burrillville for an independent environmental analysis and the appointment of an independent expert to study adverse environmental impacts of the power plant; Invenergy seeks to shield information from the public in recently submitted testimony from Niland; and the town Charlestown requests money for costs it has incurred since receiving intervenor status, such as legal fees and expert analysis. The town also wants more time to identify the potential effects of the water deal. The public will not be allowed to speak at either Dec. 12 hearing. The EFSB will also discuss the application timetable. Recent delays, primarily caused by water agreements and a failure to secure advanced sale of CREC’s electricity, have pushed the start of the final round of hearings until April. The hearings may run through July. The EFSB then has 60 days to render a decision on the power plant, during which time it will hold open meetings to discuss the application. A decision isn't likely until at least September.